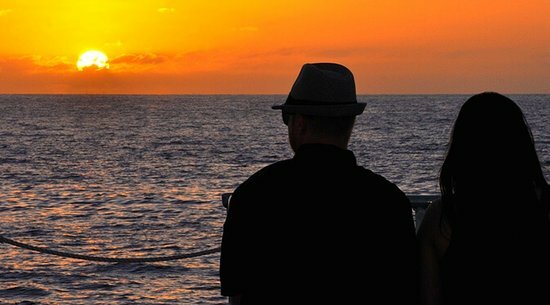 Taking a romantic sunset cruise with the one you love is something that everyone ought to experience at least once. It'll make for an evening that you'll remember forever, and is well worth the splurge! Plus with perfect weather, breathtaking sunsets, and a whale or two thrown in (from November to May), Maui is one of the best places to do it. 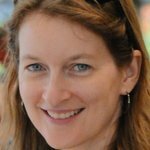 Have the kids with you? Consider taking advantage of your hotel's babysitting service just this once! 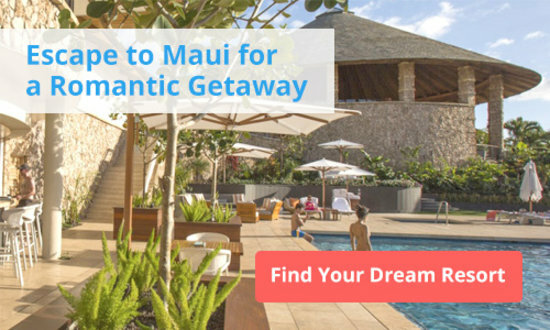 What makes this such a perfect way to spend an evening on Maui? For starters, there's the drop-dead gorgeous ocean sunset. Then mix in the gentle rhythm of the boat cutting through the waves, mouth-watering cocktails, fantastic food, plus music to set the mood, and, well, why wouldn't you want to be a part of that? Here are four of the best options for an enchanting evening at sea! 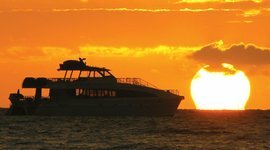 Let's start with one of the most most well-known, and reputable, tour companies on Maui: Trilogy Excursions. 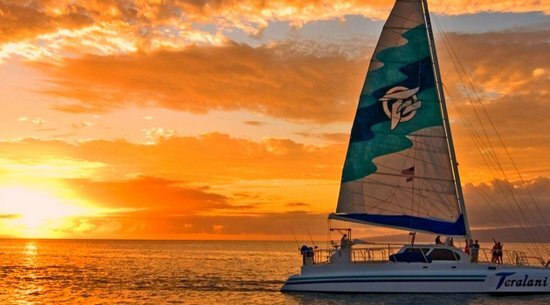 Originally known for their morning snorkeling tours with delectable homemade cinnamon buns, they've expanded their stellar offerings to include Maui sunset cruises too! You'll sit back and drink in the views (and maybe a cocktail too?) as Chef Bailey prepares your three-course meal, served to you at your table as the catamaran rests in a sheltered cove. No children are allowed on this tour, in keeping with the romantic sunset vibe. You save $10.10 per person, bringing your price to just under $120 per ticket! Pride of Maui also offers a nice sunset cruise, and if you're bringing your kids along, it’s one to consider. I know, kids and romance don't typically go together, but hey, there's something to be said for enjoying an evening with your love, and the family you've built together. This outing will cost you just under $60 per adult ticket and includes appetizers, an open bar, and entertainment. Kids tickets are just under $38 each. You save $10 per adult! So I know that Pacific Whale Foundation probably isn't the first name that comes to mind when you think romance. But, I've been on one of their sunset cocktail cruises, and we had a fabulous time for a great price. You'll ride on their double-decker 65-foot catamaran and enjoy delicious hot and cold appetizers, plus an assortment of cocktails, and unlimited soft drinks. And of course, there's Hawaiian music to cap it all off. This is another tour that allows kids, but I don't recall seeing any along on our trip. In any case, the boat is big enough that if you do want to avoid little ones for a night, odds are you'll be able to find a kid-free corner to enjoy a romantic moment. You save $9 per adult ticket, bringing your price to just under $54! Picture this: you're relaxing on a gorgeous stretch of perfect beach listening to the crash of the surf, watching the glowing sun glide slowly towards the horizon. A gorgeous sail boat pulls up, you get on and sail away into the sunset while being spoiled with great food, cocktails, and music to set the mood. That sums up what you get with Teralani's Maui sunset cruise. It's pretty much the perfect romantic set up. Teralani is a sailing catamaran that offers the super cool option of boarding their boat directly off the famous Ka’anapali Beach. There are few places nicer to be than Ka’anapali beach in the time leading up to sunset – the place positively glows, like few other places on the island. Teralani offers a choice of a cocktail cruise, or a full-on dinner cruise, and the prices are reasonable. 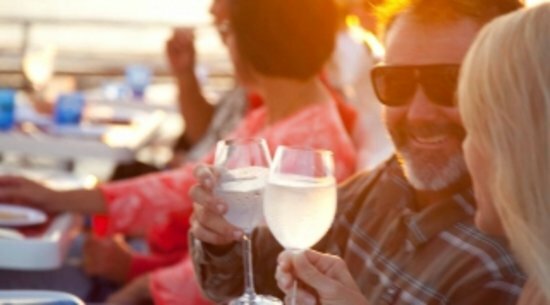 For adults, cocktail cruise tickets are under $59, and the dinner cruise will cost you about $20 extra per person. They also allow children, but you'll find that for most part, the passenger list is overwhelmingly dominated by adults. You save $3.10 per adult ticket! You save $4.10 per adult ticket!